PanARMENIAN.Net - Cancer will kill nearly 10 million people this year, experts said this week, and warned that the disease’s global burden continues to rise in spite of better prevention and earlier diagnosis, South China Morning Post. reports. 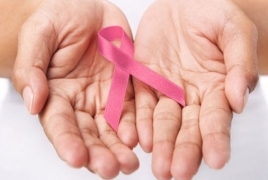 An estimated 18.1 million new cancer cases, and 9.6 million deaths, were predicted worldwide for 2018 in a report by the International Agency for Research on Cancer (IARC). This is up from the estimated 14.1 million new cancer cases and 8.2 million deaths reported in the agency’s last assessment six years ago. An increased focus on prevention – encouraging people to exercise, quit smoking, and eat a healthy diet – led to a drop in certain types of cancer in some population groups, say the IARC. Yet the overall number of new cases is racing ahead of efforts to contain the disease. “These new figures highlight that much remains to be done to address the alarming rise in the cancer burden globally and that prevention has a key role to play,” says IARC director Christopher Wild.